Volks can disport themselves in more than just a wagen, it seems. 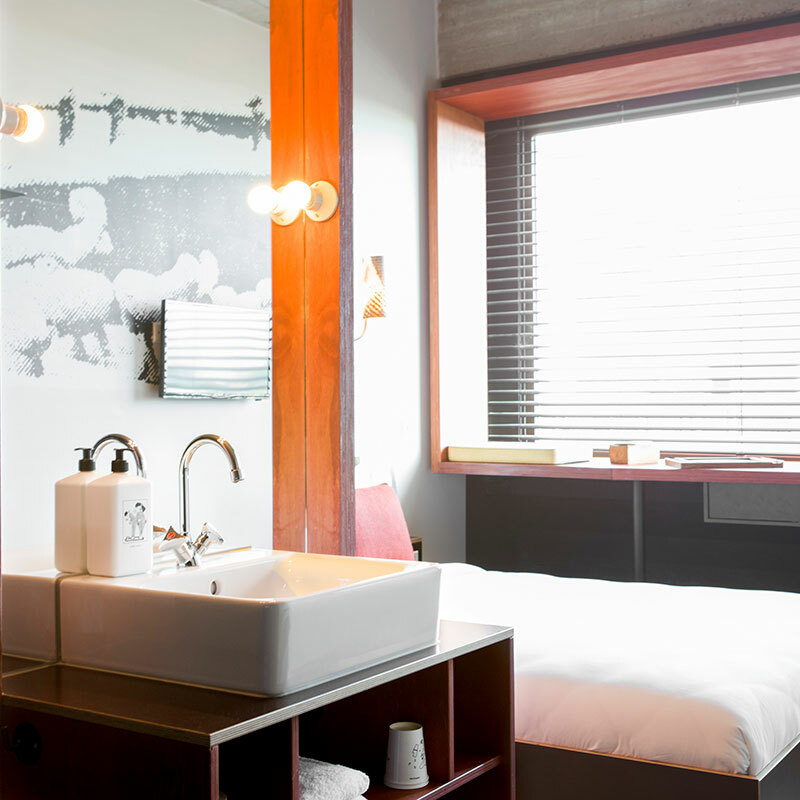 Volkshotel rests in all its renovated glory on the banks of the Amstel, southeast of Amsterdam’s canal belt — though perhaps it would be best to call it more of a Centre, as the proprietors are wont, given the variety of uses to which they put the property. 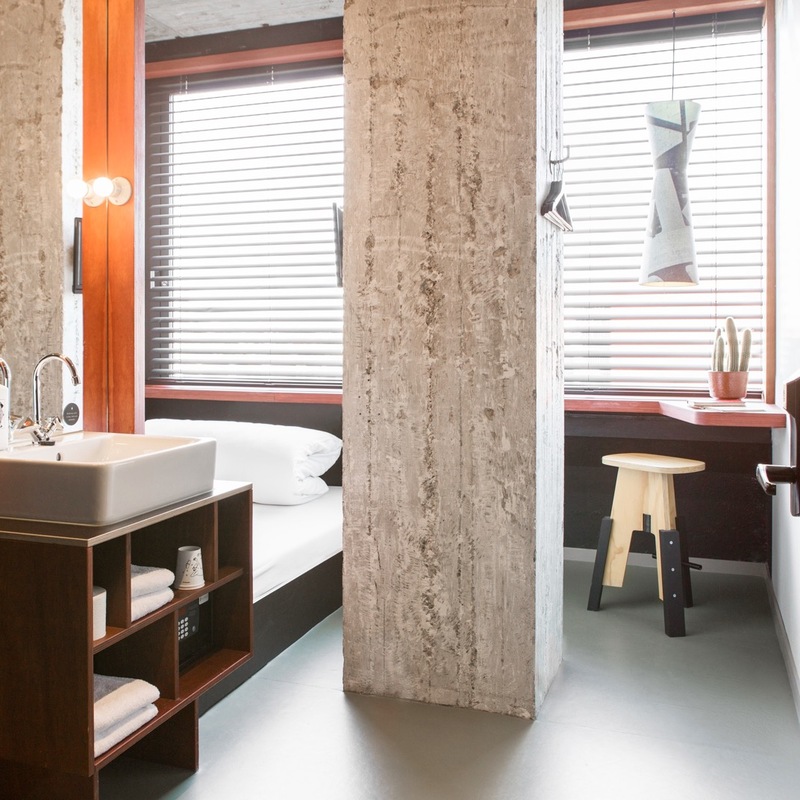 Once the headquarters of Dutch daily de Volkskrant, its open-design ’60s concrete structure — nicknamed “The White Swan” — was given new life as a creative workspace and restaurant by Urban Resort Foundation, both eventually incorporated into the hotel’s current incarnation. 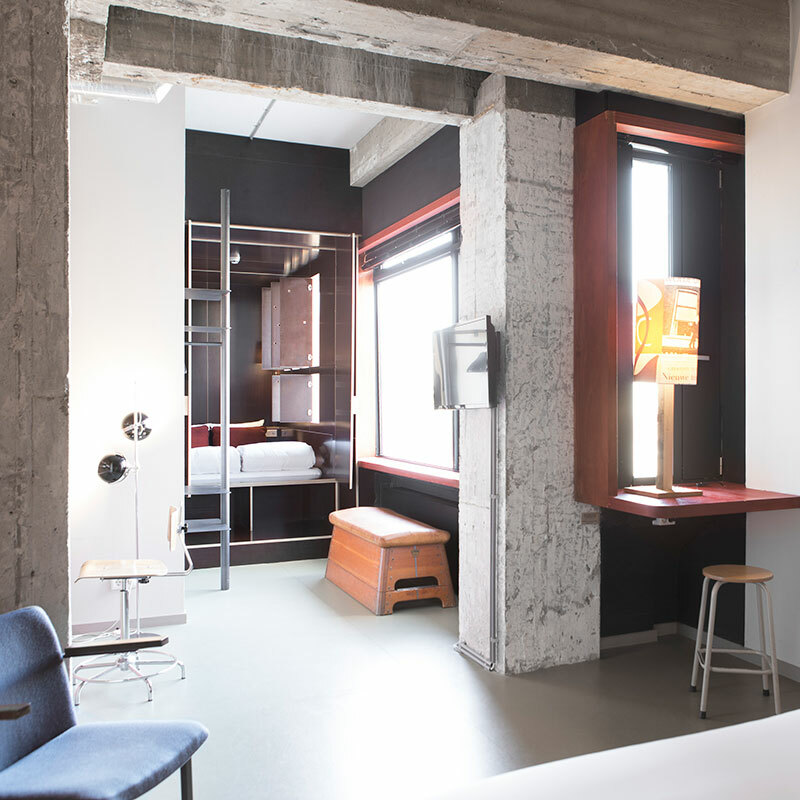 In the capable designers’ hands of Steven Steenbruggen and Bas van Tol, it’s morphed into a social hub for travelers, artists, nightclubbers, entrepreneurs, and dedicated foodies. 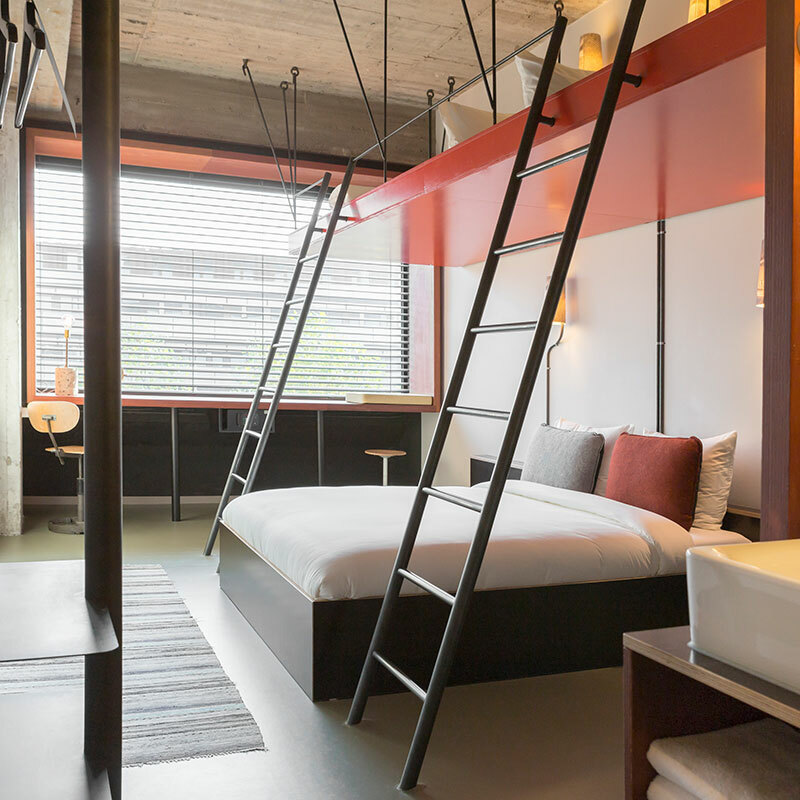 Luckily, it succeeds with respect to each demographic, by design — a bit like the similarly named automaker, this hotel aims to include everyone. Echoes of the original inhabitants find purchase throughout the decor in magnified newsprint cutouts and iconic archive photography, lent a distinct woodshop feel by raw finishes and expanses of glossy concrete. These trace their source to Broedplaats VKG, the thriving arts residency space, but also expand outwards and upwards to the rooms themselves, available in either standard or “special” models. 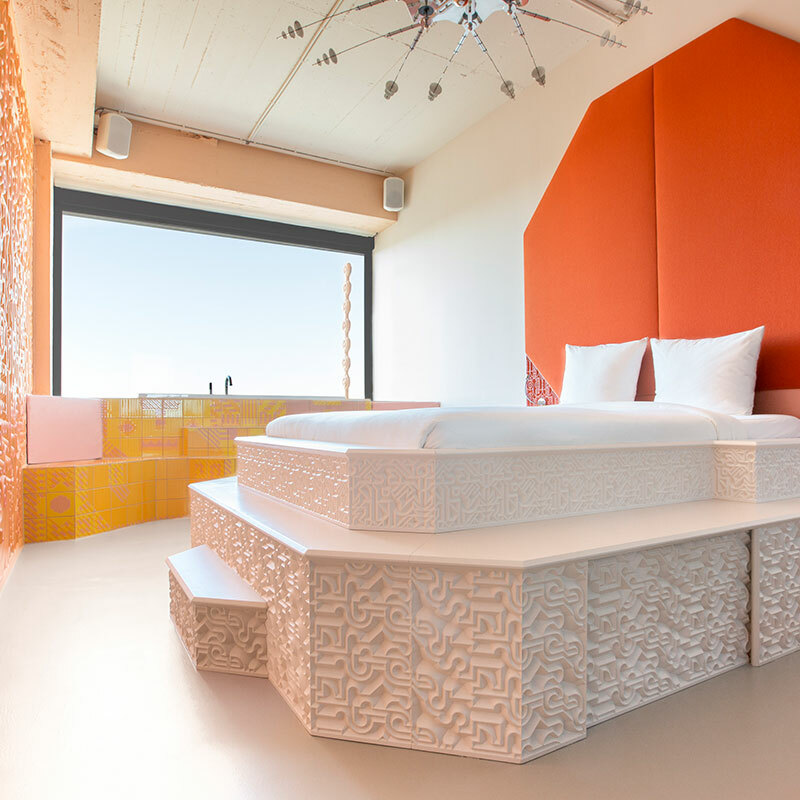 The latter, nine in total, were conceived and executed by invited guest designers, and it shows: they run the gamut from an immersive treehouse environment to a cycling-themed hideaway and even a “cinema boudoir” with a giant projector. 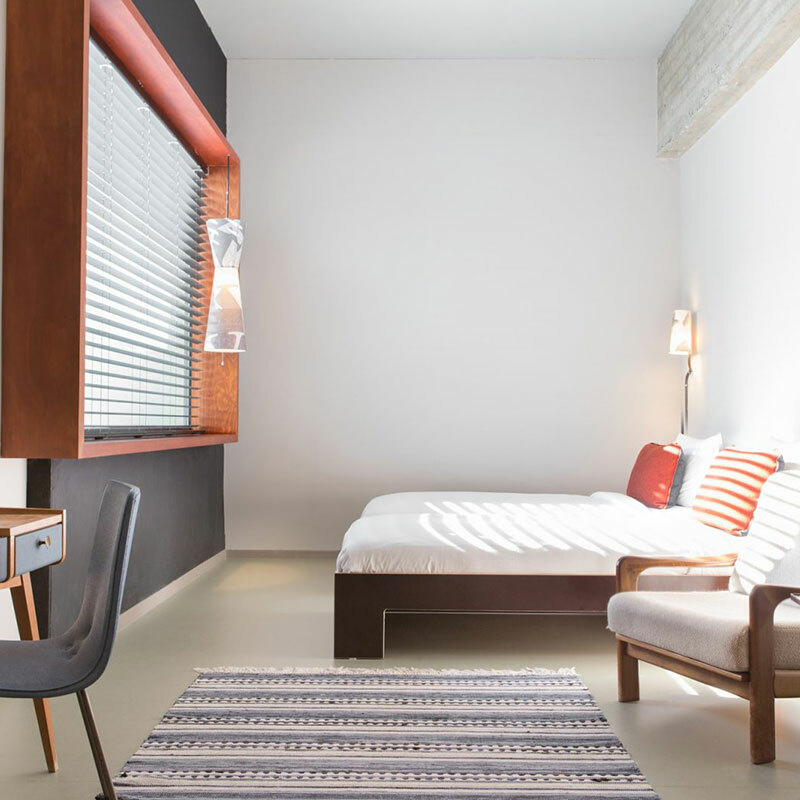 Standard rooms are not without a charm all their own, boasting smart Continental thrift in the bedstee tradition with chic touches of jet and maroon meant to bolster and diffuse the region’s famously pellucid light. They’re cozy, even handy, sounding the Volkshotel’s trademark note of irrepressible fun, if you can tune in. 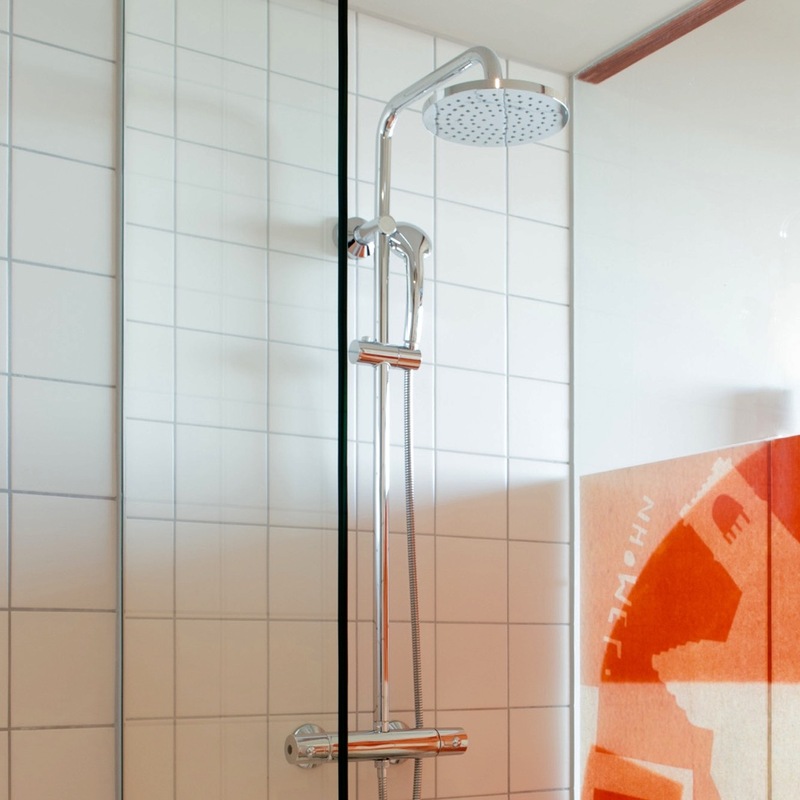 Free, quick WiFi, rain shower heads, and silkscreened wall art tie it all together. The lobby is a fine spot to start or end a night with a swanky little bar and a fine beer selection. On the seventh floor and the rooftop terrace is Canvas, an informal brasserie specializing in European wines and an abundance of candles. It turns into a club late at night, attracting a cultured house/rave crowd with well curated events and outsize DJs; basement cocktail bar Doka alternates similar music with interactive lectures and classical quartets, though it doesn’t open until 11 pm, to give you an idea of the ambience. Back to the roof, though, for one of the hotel’s — and city’s — finest features: the incredible views. Trust us, you won’t regret drinking them in from the rooftop hot tubs at night. Special rooms vary in style and all feature projectors.